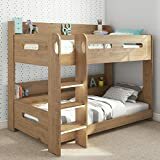 Wooden bunk beds could make and prove a worthwhile investment as they tend to be perfect for most bedroom types. 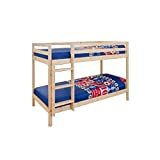 Whether you are a landlord looking for cheap wooden bunk beds to furnish your small double rooms with to comfortably sleep your tenants, or whether you are a small or large family with adults and kids requiring multiple beds, here is a list of the best selling wooden bunk beds that you could comfortably go for. 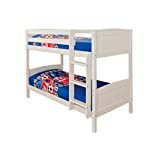 Milan Modern style kids wooden white bunk bed frame is a stand out from the rest of the bunk beds - NEXT WORKING DAY DELIVERY - MATTRESSES NOT INCLUDED - Compliance with the requirements of UK bunk beds (Entrapment Hazards) (Safety Regulations 1987) and the European Standards (EN747-1). We offer a FREE delivery to mainland England, Wales and Scotland. Sorry no offshore deliveries. 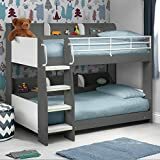 RANGE NAME: Everest HEAVY DUTY sleeper bunk bed. 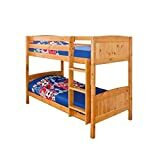 This is a VERY STRONG bunk bed. Extra wide solid pine base slats supported by additional centre rail support system. The ladder has extra thick flat "easy on the feet" ladder rungs and can go to the left or right of the bed. The product is sold for easy home assembly.